Criminals Beware! 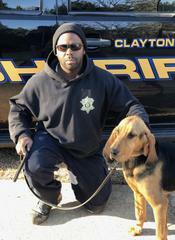 SHERIFF VICTOR HILL’s new bloodhound named “Tracker” Is Now On Patrol! If criminals thought getting away from the long arm of the Clayton County Sheriff’s Office was challenging before, 2019 will prove to be a true nightmare for them. Seven months ago, Sheriff Victor Hill approved the purchase of a bloodhound to assist with the manhunts and apprehensions of criminals and named the K9 “Tracker”. Yesterday K9 “Tracker” successfully completed 7 months of K9 School just in time for Christmas! As a result “Tracker” now holds a level 1 tracking certification with United Police Work Dog Association (UPWDA), which is federally recognized. Level 1 is one of the hardest tracking certification to obtain due to the require terrain, sat times, and distance required to obtain the certification. Attached is a picture of “Tracker” with her handler Deputy Tony Griffin after graduation. One of “Tracker’s” most notable successful tracks in training was one she did that was four days old after rain had fallen for two days. Tracker successfully tracked the human scent across several different terrains to include roadways for several miles. Tracker will not only be used to hunt bad guys, but will also be deployed to find missing children and elderly people who may have gotten lost because of dementia. “Tracker” is the first law-enforcement bloodhound in the history of Clayton County and is a wonderful Christmas present to the County for extra security and protection. Criminals Beware!